Amityville 3-D (also known as Amityville III: The Demon) is a 1983 American-Mexican supernatural horror film and the third film based on the Amityville horror. It was one of a spate of 3-D films released in the early 1980s. The film was directed by Richard Fleischer and the script was written by David Ambrose (under the pseudonym William Wales). 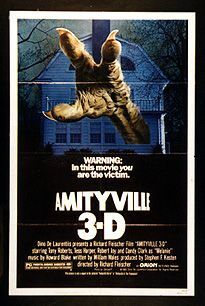 It was the only Orion Pictures film filmed in 3-D. Due to a lawsuit between the Lutz family and Dino De Laurentiis over the storyline which did not involve the Lutz family, Amityville 3-D was not called a sequel. However the film does make reference to the original Amityville Horror story. The character of John Baxter is loosely based on Stephen Kaplan who at the time was trying to prove the Lutzes' story was a hoax. The name Lutz is never used in the film. The DeFeo family is referenced more than once, despite the fact that the name had been changed to Montelli in the previous entry in the series Amityville II: The Possession. After he exposes a pair of con artists with his partner Melanie (Candy Clark) in the infamous 112 Ocean Avenue house in Amityville journalist John Baxter (Tony Roberts) is persuaded to purchase the house by real estate agent Clifford Sanders (John Harkins). While preparing the house for John, Clifford investigates footsteps in the attic. He is locked in the room, where a swarm of flies attack and kill him. John believes Clifford died of a stroke, even after Melanie shows him some photos she took of the real estate agent before his death which depict him as a rotting corpse. While John is at work, he nearly dies in a malfunctioning elevator. Simultaneously, Melanie experiences bizarre occurrences in John's house. She is found later that night by John, cowering and hysterical against the wall. Her attempts to convince John that something is inside the house fall on deaf ears. Later, while looking over blowups of the photos of Clifford, Melanie discovers a demonic-looking face in the pictures. When she attempts to show the photos to John, she is killed in a horrific car accident. Melanie's death is ruled accidental by everyone, including John, who remains oblivious to the evil in his home. While John is away one day his daughter Susan (Lori Loughlin) and her friend Lisa (Meg Ryan) and two boyfriends use a Ouija board in the attic. The game tells them Susan is in danger. Growing bored, Susan and the others go out in John's motorboat. Susan's mother Nancy (Tess Harper), who has come to look for her, is surprised to see a drenched Susan silently walk up the stairs. Outside John arrives home to find Susan's friends bringing her lifeless body to shore. Nancy has a nervous breakdown and believing Susan is still alive and will return shortly, refuses to leave, even for Susan's funeral. After having nightmares about the old well in the basement and unable to deal with Nancy's delusions that Susan is still alive, John allows his friend, paranormal investigator Doctor Elliot West (Robert Joy), and a team of paranormal investigators to set up in the house, to help prove if Nancy actually saw something or not. As Elliot and John watch, Nancy is confronted by a spectral being speaking in Susan's voice. Nancy follows the spectre into the basement, where the old well has filled with liquid. Elliot urges whatever is in the well to reveal itself and restore Susan to life. Instead, a demon leaps from the well, burns Elliot's face with fiery breath and drags him to Hell. The house begins to implode. Much of Elliot's team is killed by flying and exploding objects, but John and Nancy and several others escape through a window. As John and Nancy leave, the well bubbles ominously as an eerily glowing fly emerges from it. Like the previous installment, exterior scenes for Amityville 3-D were shot at a house in Toms River, New Jersey, that closely resembled the infamous house at Amityville, New York. (A house nearby was employed for the exterior of Nancy's house.) Interiors were filmed at a studio in Mexico. The filmmakers very nearly missed their chance to film at the Toms River home, as it was slated to be picked up and moved over one lot. They were just able to film the exterior shots before the house was moved. Originally the house had four quarter-shaped moon windows, two on both sides. However, by the time Amityville 3-D was made, the owners of the house had decided they did not want the eye windows on the side of the house facing the road, so they modified them to look like small ordinary square windows. All shots of the "eye" windows (except for the most noticeable scene when John and Susan pull up to the house) had to be filmed on the side of the house facing the river. Like Jaws 3-D (which was released in July 1983), Amityville 3-D was filmed using the ArriVision 3-D process, supervised for this film by cinematographer Tibor Sands. ArriVision produced 3-D movies in full color, using a single camera and a single strip of film. A special twin-lens module fitted to the Arriflex camera divided the ordinary 35mm frame in half, placing left and right two-perf, Techniscope-sized frames one above the other in a "stacked" configuration. A single, standard projector outfitted with a special converging projection lens allowed for relatively simple presentation of the resulting stereo imagery in cinemas. Movie patrons were given disposable cardboard polarized glasses to view the film, creating the illusion that certain props and elements were coming toward the viewers. In this case: a pole penetrates a car window, a Frisbee flies out of the screen, a skeleton reaches out its arms, and a set of French doors fly at the audience during the climactic scene. One recurring complaint is that some images in Amityville 3-D are blurry and distorted. Chicago Sun-Times critic Roger Ebert complained that the images were indistinct and that the film “really looks crummy.” Chicago Tribune critic Gene Siskel said that "The 3D added nothing to the experience. All you ended up with was eyestrain." Amityville 3D was received negatively by critics and, in many cases, was selected as one of the worst films of 1983. Currently it maintains a 5% rating on Rotten Tomatoes. Variety reported “A new cast of characters and the addition of 3-D does little to pump new life, supernatural or otherwise, into this tired genre.” Janet Maslin of The New York Times wrote, "Once the first two films in a series have exhausted most opportunities for action, the third is liable to average half a dozen exposition scenes for every eventful episode." Of the 3D, she said "3-D exposition is the stuff of which headaches are made; the footage tends to be so dark that you can barely tell whether it's night or day." While released theatrically in 3-D, the only 3-D home release of the film has been on DVD in the UK and as of August 2012, also in Scandinavia. In October 2013, Scream Factory released a 3-D Blu-ray of Amityville 3-D, along with The Amityville Horror and Amityville II: The Possession. [dead link] A novelization of the film was written by Gordon McGill while Howard Blake wrote a score for the film, which was released on CD in 2000 as part of the Original Orchestral Score for Flash Gordon. MGM Home Entertainment originally released the DVD with the theatrical title "Amityville 3-D" (also the title on the opening title card of the film itself) on the box artwork. However they received many complaints as the film wasn't actually in 3-D and some even mistakenly mistook the release as a 3-D version of the original 1979 film "The Amityville Horror". Due to this they re-released the DVD with the foreign territory title "Amityville III: The Demon" on the box artwork despite the film itself retaining "Amityville 3-D" on the title card. Amityville 3-D finished its opening box office weekend at #1, with a box office take of $2,366,472 according to Box Office Mojo. The following weekend it dropped to #5 and a 21% drop, in the second weekend. Its final domestic gross ended at $6,333,135. It was ultimately considered a box office flop and ended up being the last film in the series released theatrically until the remake of The Amityville Horror in 2005. ^ "David Ambrose Biography (1943-)". www.filmreference.com. Retrieved March 26, 2019. ^ Stacilayne (April 9, 2005). "Exclusive Interview with George Lutz and Dan Farrands - Part One | Horror.com". www.horror.com. Retrieved March 26, 2019. ^ "Amityville 3-D". Rotten Tomatoes. Fandango. Retrieved July 28, 2014. ^ "Review: 'Amityville 3-D'". Variety. Penske Media Corporation. December 31, 1982. Retrieved October 3, 2014. ^ Maslin, Janet (November 20, 1983). "Amityville 3 D (1983)". The New York Times. Retrieved October 3, 2014. ^ “THE AMITYVILLE HORROR TRILOGY” (Scream Factory Blu-ray Review). Fangoria. Retrieved October 7, 2013. This page was last edited on 26 March 2019, at 04:32 (UTC).